“My students want to learn about Buddhism. Will you come and talk to them?” The invitation Yasser’s invitation to speak to a classroom of young Palestinian women about Buddhism delights me. So, on Saturday morning (not considered the weekend here) I have my simple breakfast of coffee, toast and banana; get dressed for the day in light-colored linens—loose fitting pants and a long-sleeved blouse—appropriate for and respectful of the more conservative aspects of the culture; gather together what I will take with me; and wait with Bob outside the apartment building for Yasser to pick us up. (We pack carefully since neither of us is eager to climb twelve flights of stairs to retrieve what might have been forgotten.) As we wait alongside the dusty, dirt road near the apartment building, we watch children of all ages, boys and girls, neatly dressed in their school uniforms and carrying backpacks walk towards school. Some are in cars driven by a parent. This is final exam time, and a few of the children carry an open book and appear to be doing some last-minute review of whatever subject they will be tested on today. We are greeted with smiles from most who pass us, and, with glances back over the shoulder, several of the children get another look at these foreigners standing on their street. I wonder what they see through their eyes as they look at us. 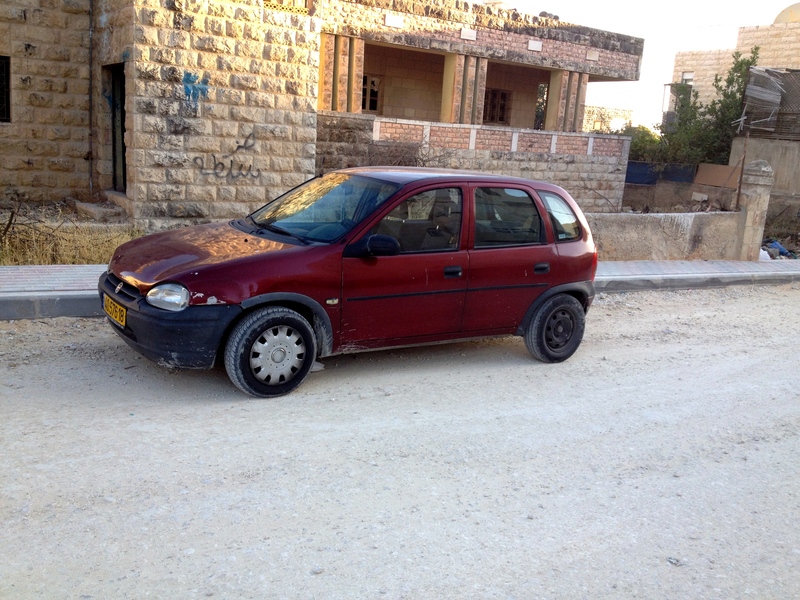 We see Yasser’s dark maroon Opel coming up the hill, a cloud of dust billowing behind it. Yasser loves this car—he says it is like a good friend: familiar and reliable. While it is well-worn (windows that won’t close completely, a back door that when closed has a space around the edges allowing air to blow inside, dents in various places on the body of the car, the absence of hubcaps), it is well cared for, too. Yasser keeps it very clean and maintains it properly with regular check-ups and servicing. We climb into the car, Bob in the front seat and I in the back—definitely my preference since Yasser drives fast and hard and the roads are rough. And, there are no clear rules about driving here, so at times the movement of traffic seems chaotic and scary (to me). He is a competent driver, however, and his demeanor is calm and steady (betrayed only by his regular little toots of the horn as he maneuvers in and around and through the driving terrain). I refrain from back-seat driving tendencies—although it is hard for me—and breathe through anxiety that arises. While I am not in control of the driving, I can influence how I respond to it. I am aware that this is a very good “letting-go” practice, and I feel moments of calmness and an easing of tension in my body. As I sit in the back seat mindful of my breathing and the tightening and relaxing of my body, I look out the rattling (but clean) window and begin to think of the condition of cars and roads and how they tell a story of life here in Palestine. People here do the best they can with what they have. On a daily basis, they negotiate rough, unpaved roads; respond to omnipresent potholes; wait for long periods of time at check points while breathing in dust and exhaust fumes, all the while uncertain about how the 19-year-old Israeli soldier will respond to them when they are (and sometimes are not) allowed through. And, a 5-minute drive takes up to an hour or more. With few exceptions, their cars are old, battered and worn. This is the way it is: at least how it has been for many years and how it will be for who knows how much longer. The Palestinian people have learned to practice restraint and samoud, steadfastness, as they live with knowing they have little power in this Holy Land that has been their home for hundreds of years. Like us all, they are not in control of the unfolding of their lives; and, like us all, they can influence the ways in which they respond to their lives. But, while it is true that we all experience the gritty and unsatisfactory inevitabilities of life—loss, sickness, aging, death—it is also true that we are not all living by the same set of rules. Palestinians living in Israel, the West Bank and Gaza are denied many of the human rights I have taken for granted in my life. Living in a Palestinian community, I am seeing this more than ever before—and there are times in the seeing when I feel deep shame. I am learning from the Palestinian people in ways I hadn’t expected. While the practice of and experience of restraint and patience in the mind-body-heart may be similarly felt, the “normal” circumstances for practice in many ways are vastly different. I have a day-to-day ease in living circumstances they do not have. I live with the fundamental privilege of knowing that—while exceptions are always possible—for all intents and purposes, my human rights are protected. Such is not the case for the Palestinian people. And, knowing this I wonder—what would it feel like and how would I do with these added layers of loss in the inevitability of life experience? The right to national self-determination within their own land. How would I do with these added layers of loss in the inevitability of life experience? May my heart know your heart…May we be free from the delusion of separateness.